Security Memetics: Is there a #MeToo for airline passengers? I've certainly gotten a disturbing pat down on the front of my trousers before when the wand supposedly false alarmed on my zipper. This was before enhanced pat downs went into effect and before agents were given the special training on how to deal with that area. I imagine many people in that sort of situation don't even consider raising a stink about it. I know I didn't. 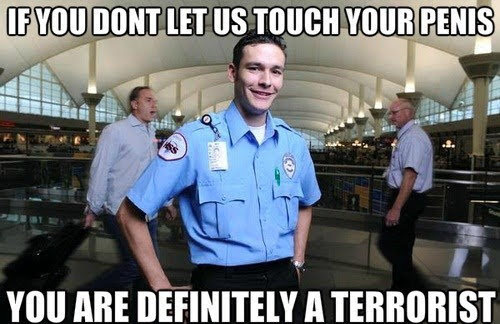 The TSA are the authorities in an airport, so who would you report them to? And even if you did, how could you know for sure you wouldn't risk missing your flight? We probably shouldn't think of the violations as just part of the price of flying but I think to a large extent we probably do anyway. I think the TSA has always had creepers in it. It's a job where ordinary folks are given extraordinary power over other people and sexual assault is very much about power so it kinda seems like a perfect fit.